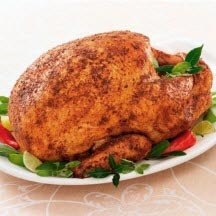 A whole, unstuffed turkey is heavily coated in a spicy, south-of-the-border-style rub and marinated in the refrigerator for a minimum of 12 hours to overnight prior to roasting with extremely flavorful results. Remove neck and giblets from body and neck cavities of turkey; refrigerate for another use or discard. Drain juices from turkey; pat dry with paper towels. Turn wings back to hold neck skin in place. Return legs to the tucked position, if untucked. Place turkey, breast side up, on flat rack in shallow roasting pan. Brush outside of the turkey with half of oil; rub outside and inside cavity with spice mixture. Cover and refrigerate 12 hours or overnight. Brush spiced turkey with remaining 3 tablespoons oil. Bake approximately 3 hours*, or until meat thermometer reaches 180°F (approximately 85°C) when inserted in thickest part of thigh. Remove turkey from oven. *Follow cooking times according to package directions; times vary by size of turkey. Tip: For a spicier rub, increase crushed red pepper to 1 tablespoon and add 1 or 2 teaspoons cayenne pepper. Recipe and photograph provided courtesy of Butterball®; through ECES, Inc., Electronic Color Editorial Services.